The changing of the seasons is upon us. Fall is here. The vegetation is dying off for another year. We are getting into the lovely reddish browns now. One of my favorite colors. As you can see here in this composition the marsh vegetation is turning color. The ferns on the forest floor under the pine trees are starting to change to a yellowish color. Thus breaking up the mass amount of green. The pine trunks stand out in stark contrast. With that being said, I used the small channel of water as my lead in to the pine trees. That is it for now. Thank you for stopping by. I welcome my new friends who have subscribed to my blog this past week. I hope that you will enjoy what Mother Nature has to offer in my part of the country. So until next time happy trails. When I had first paddled OSA Lake with my wife Maureen,we spotted four rounded rocky tops on the South side of the lake.I was quite taken with the view we had and I jokingly called them the Four Sisters.My wife just smiled and we have called these rock formations that are part of the La Cloche Mountain system by that name ever since.I am not aware as to whether they actually have a name.I am bound and determine to capture this scenic view but will have to wait another year.I captured them in outline but not in detail. The above photo was taken from the same setup as the photo in the previous post.By waiting and being patient you will get a number of different lighting conditions as the morning progresses.It is quite remarkable to watch this happen while you sit spellbound and in awe of what is happening before you. 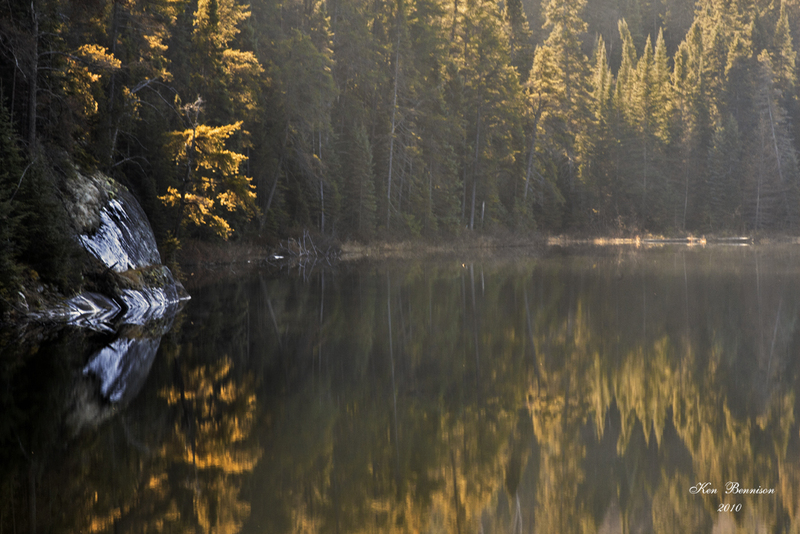 The lake is bathed in reflected images of the surrounding shorelines. 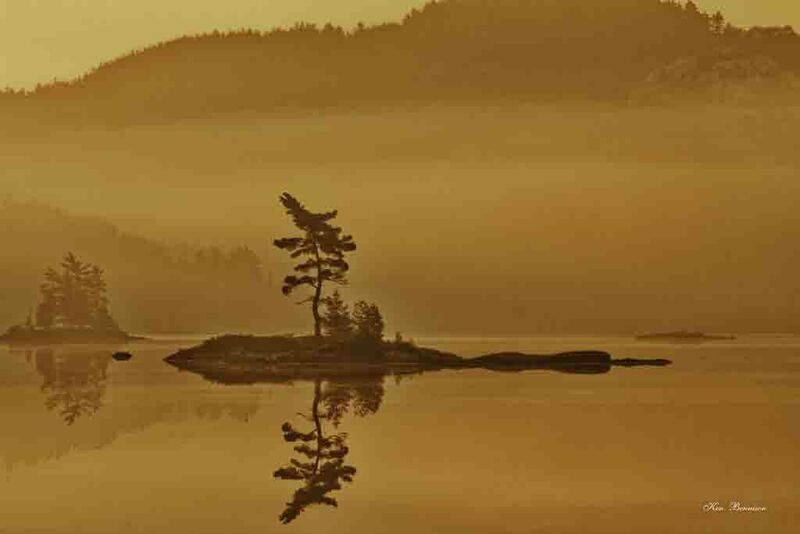 I thought I would do something different this post.I am not a poet.I thought I would put down the above thoughts as they came to me while I viewed this photo in print.It was truly an enchanting morning in the wilderness on OSA Lake in Killarney Provincial Park.It took a four day and a five day trip into OSA to capture this photo along with others. That is it for this post.Happy trails. A couple weeks ago on a Monday,I headed up the Westbranch North of Webbwood to do some photographing.My destination was about 80 km up the Westbranch to a couple of lakes that I had been exploring this Fall. 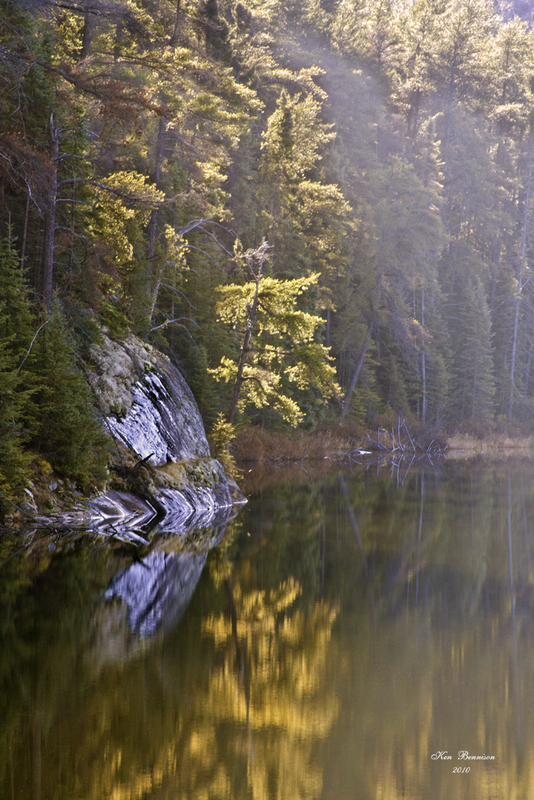 These lakes are surrounded by Jack Pine and White Pine so bare deciduous trees are not an issue here.I was interested in one small lake that had an interesting cliff face that I have made a number of attempts to photograph without success. Upon arrival I loaded up my gear and picked up the trail along the lake.This is a very small lake nestled down in between a series of hills.It was now about 11:30 in the morning. 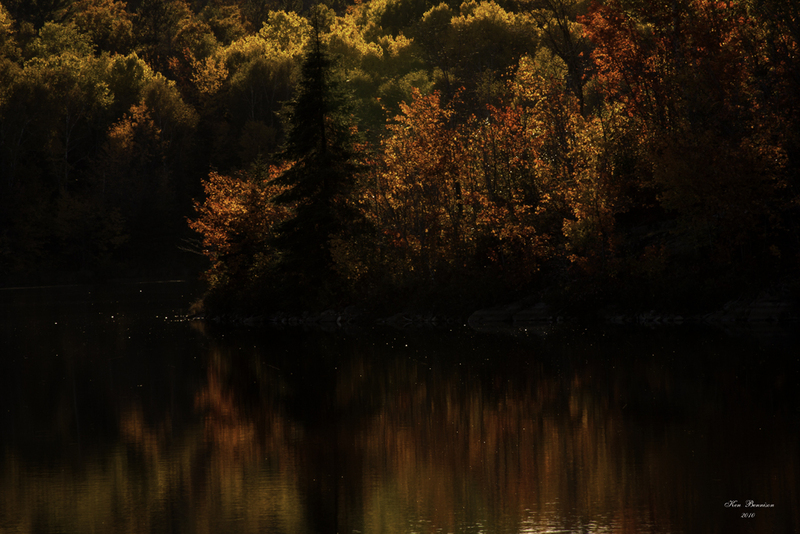 While I was walking towards the cliff face I noticed out of the corner of my eye a display of some beautiful lighting highlighting the evergreens along the shoreline. 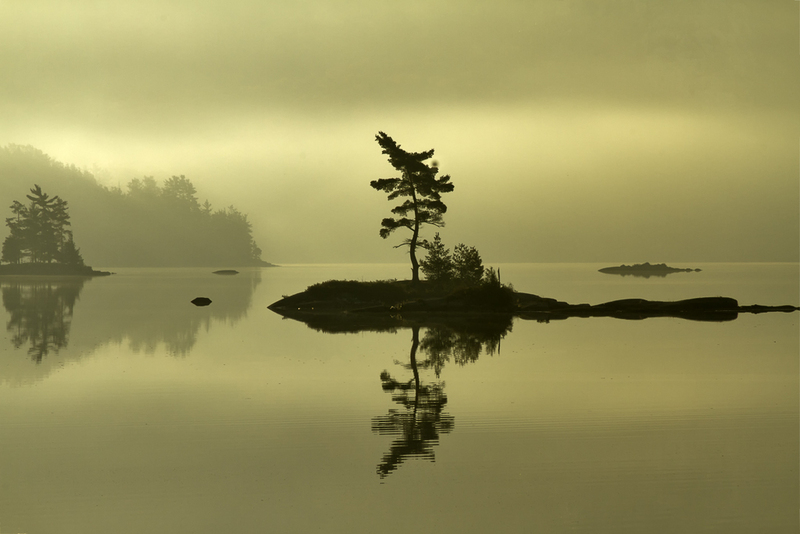 I set up my camera and tripod and composed a vertical shot using the small rock point as my focal point.At this time of year,mid November the sun is low to the horizon allowing for this kind of lighting at mid day.There was mist over the water to add atmosphere.There was a nice reflection on the water to add depth to the photo.I focused on the rock then I composed the shot.The zoom lens was set at 135 mm with the shutter at 0.5 sec @f22. The above shot was taken in the same location as the first shot.I was attracted by the lighting on the far trees creating a nice lighting pattern and reflecting into the water.The sun always creates a beautiful gold color when it highlights evergreens.The zoom was set to 100 mm an d the shutter speed to 0.4 sec @f22. This allowed me to create a nice peaceful mood. I never did get my shot of the the cliff.Oh well next time.Before I go I want to thank everyone who has visited my blog as I have now surpassed a 1000 hits.This is a milestone for me.So for now happy trails. Paul Smith and I decided to drive to the far end of Bass Lake and do some exploring.Parking our trucks off the main road we gathered up our gear.We followed a trail along the shore line looking for photo opportunities. As we walked along the shore I noticed a point of land that was lit up by sunlight from behind and causing a very colorful scene.In the backdrop of the hillside was a awesome display of lighting to create this spectacular scene. There was a slight breeze blowing that created a painting like effect on the reflection in the water.I shot this photo with a zoom setting of 132 mm and the shutter speed at 1/10 sec @f22. The sun was getting low in the sky and the wind was creating some problems.One problem we had was that we were by a beaver house. An adult beaver kept swimming back and forth in front of us disturbing the water.Needless to say along with wind and beaver waves,the water was not getting calm.We made it to the end of the lake and came upon private property.It was now getting dark.We hiked back to the trucks and called it a day. Paul Smith and I were having a conversation one day as we were heading out on one of our adventures.Paul mentioned that I should check out Bass Lake about 10 minutes from home.This mid size lake is surrounded by broad-leafed trees that would add some very nice fall colors. A couple weeks later my Mother drove in and asked if I would take her to Lively so she could do some banking.As we were driving I thought that I would go and check out this Bass Lake on the way back home. Returning from Lively I drove off of Highway 17 onto the Fairbanks Road.This road will take you directly to Fairbanks Provincial Park on Fairbanks Lake.When we neared Bass Lake I noticed the far shoreline had a lot of color yet and the wind was minimal.I then decided to head home and gather up the camera gear. Upon reaching home I called up Paul and told him That I was heading to Bass Lake for a photo shoot.Paul told me he would meet me there but would be a few minutes late.I gathered up the camera gear and Mother said she was going for a nap.I arrived at Bass Lake in short order.One thing I notice was there was heavy traffic on this road.There was also a fair amount of heavy trucks hauling on the road. I proceeded to set the camera and tripod up on the shoulder of the road,mindful of the oncoming traffic. The lake came up to the road here so there was not much room to setup.I decided quickly to do a Pano here.There was and old building on a rock point with a door leaning on the building’s front wall.Yellow leaves highlighted by the sun was the predominant color behind the building .Looking to the right I noticed a cottage showing through the trees.I did not want to include this cottage but saw a nice small Maple tree glowing red.That would me my right anchor.I then proceed to take four overlapping shots.I kept the shots fairly tight as to show no sky and just enough reflection to add color and detail to the composition.The water was just calm enough to create that painted effect on the colored reflections in the water.